Gatefold Easel card ...complicated? No very easy to do. 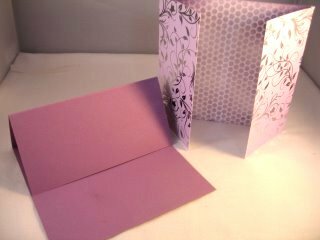 Have you tried making a Gatefold card yet? And did you like the effect it gave you? Have you had a go at the Easel Card? I am sure you found both of them easy to create. 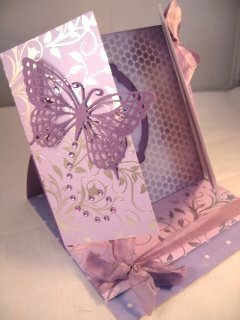 Well this one goes a step further and combines the two very pretty but very different designs in one easy to make card. In the picture the Easel card is on the left and the Gatefold on the right. The Easel card is also in a short video. Whatever size you make your easel card you will need to know the size of the surface area. Then when you make your gatefold it will need to be twice the width to be able to fold. For example mine is a 15cms square when it is closed up. The gatefold will need to be the same height 15cms but it needs to be twice as wide as the card at 30cms. Then from each of the outside edges it needs to be scored and folded inwards at 7.5cms. The picture shows you how it will look once you have done the folding. It will be added to the easel part as described in the tutorial, remembering to add glue only to the bottom part of the easel. Then you can raid our "Stash" box and decorate it up as you wish to suit the recipient, the occasion and you. 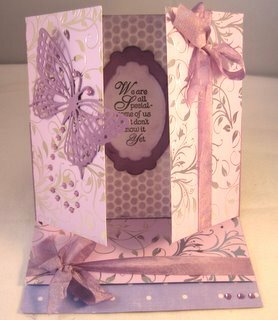 The beautiful butterfly is designed by Marianne Design Creatables. There are several choices for the butterfly that is just right for your projects. Add them to your Gatefold Easel card or any other design you make. Have fun with this and any of the other card designs you wish to try. You will find full instructions on lots of styles and lots of them are also available as Video Tutorials so just enough time to grab a cuppa as you watch.